Paris is probably the most photographed city in the world. Every street, every monument looks breathtaking. In this guide, we’ll show you some of the best photography spots in Paris. 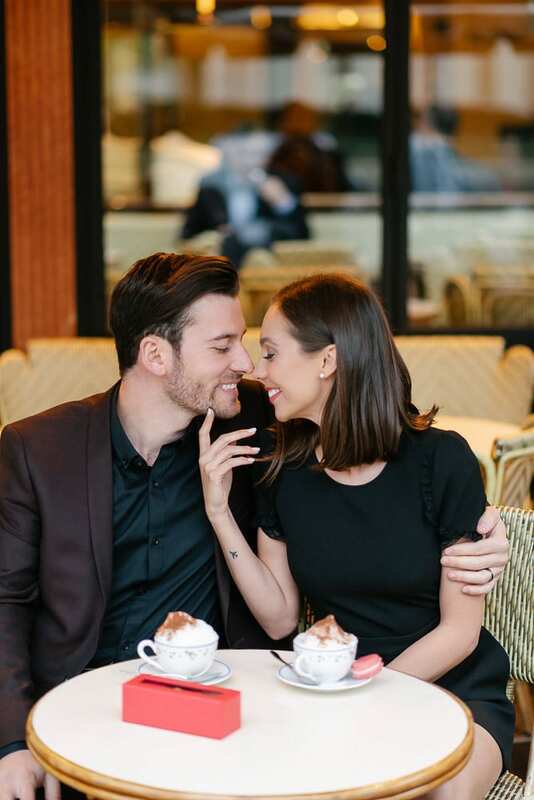 If you have booked a Paris photo shoot with us, then you will find valuable tips about which place looks better at different times of the day and in different season. If you are planning only to visit the city in the future without taking professional photos in Paris, you are in luck too. You’ll learn about the most amazing monuments and also about the less known Paris attractions, that still look fantastic in photos. Finally, every location has a certain combination of colors and texture. Smart couples choose their outfits and locations in the same time. This way, their photos have a consistent and beautiful feel. Let’s not forget also, that different locations require different props. We’ll explore all these in the paragraphs below. There are a few things to have in mind when choosing your favorite locations for your Paris photos. Besides the look and feel of a place, it has to convey you a positive vibe. Then, of course, the city changes the way it looks every season. Even more, depending on the time of the day, the light and hence the sight is different. The quality of light is equally nice in the morning as in the afternoon. During winter months, the sun rises behind the Tower creating a very flattering back-light. Given that it is one of the most iconic spots in Paris, it is obviously one of the busies places during the day and especially at sunset. That’s when people gather to watch the sunset and the Eiffel Tower lighting up. So night photos can only be taken during low tourist season at Trocadéro: from October until April. It looks beautiful in every season. During winter though, the light is magical. If you haven’t checked already our How To Dress Guide, make sure to read it, because it gives you all the tips that you need to perfectly plan your photoshoot outfit. The beauty about the Eiffel Tower is that you can wear formal or a playful attire, the pictures will still look amazing. So in the end, it’s up to you to decide on what look you’ll choose. If you do not wish to spend too much time at Trocadéro, let’s say in a scenario where you have already planned to have night photos with the Eiffel Tower. Then, it’s probably a great idea to explore the area next to the merry-go-round (Carousel) or the Seine River near by. You’ve probably seen the Bir Hakeim bridge in the movie Inception. The elegant columns make it a beautiful attraction and probably one of the best places to take photos in Paris. However, it becomes our backup plan for rainy days, when we wish to take photos with the Eiffel Tower. By the way, this view over the Eiffel at night is simply unique. Bir Hakeim is hence our favorite spot for night photo shoots in Paris. The principal advantage of the bridge over other Parisian locations is that the bridge itself is beautiful. Geometry, architecture and symmetry. It looks fabulous. It’s usually windy over the Seine River, so make sure to wear a dress that looks nice in the wind. Also, your hair will look better up in case of wind. Probably the most beautiful bridge in Paris. It connects the Champs Elysées with the Invalides quarter. It offers a breathtaking view over the Seine River and the Eiffel Tower. It works equally well for both daytime and night photos. Obvious, there are considerably more people in the afternoon, especially in the evening. This is natural, because the Alexander 3 bridge offers a gorgeous sunset view in Paris. So it is a perfect spot for creative silhouettes. In the morning, particularly during the summer, the bridge is not crowded at all. Because Parisians start their workday around 9:00AM. Any outfit works well for the Alexander 3 bridge. It is really a matter of taste and logistics. The purpose is to have variety in the looks for your photo shoot. After the Eiffel Tower, the Louvre Museum is probably the most requested location for couples pictures in Paris. 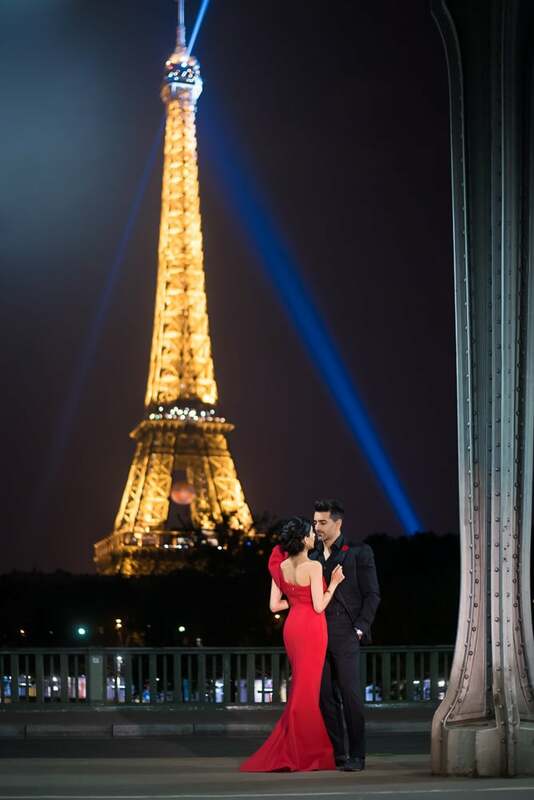 The exquisite architecture offers elegant backdrops and the Louvre Pyramid offers a modern twist to your romantic photos. As you can imagine, Louvre is one of the most visited places in the world so it gets crowded fast. Sunrise is the best time to be there. However, the iconic silhouettes and the beautiful night photos are taken during the blue hour. Right after sunset. There is just something magical about this place. It looks beautiful in every season. Formal, elegant attire is probably the most appropriate for the Louvre Museum. If during the day, we recommend pastel and light colors. At nigh, strong colors (red, blue, green) work best. In the end, it’s a matter of imagination. Because it is the most popular spot for night photos, we suggest wearing something warm during the winter months. There is no need to explain why the Tuileries Garden is probably the most beautiful park, along with the Luxembourg Gardens in Paris. There is a specific place that we absolutely love and it’s best described by perfectly trimmed trees and elegant architecture. It is Fran’s favorite place to take photos, because it is calm and beautiful. We recommend spending 30 minutes in this place and combine it with another short location, such as a Parisian café or Place Vendome. The best months to visit the Tuileries gardens are between April and November. Flowy or floaty dresses look great in pictures at the Tuileries Gardens. Generally, we recommend a not so formal attire for this location. One of the best photography spots in Paris are quaint typical Parisian cafés. This is where you can take piece of life type of pictures. Think of hot chocolate, croissants, macarons. You name it. We typically avoid the crowds and visit cafés early in the morning. However, there are many hidden cafés that are empty in the afternoon/evening. It’s smart to make a strategic stop in a café between two main locations for outfit change. This is the spot where you can be comfortable, in a more casual, but chic attire. Place Vendôme is one of the best places to take photos in Paris because it is so elegant and modern. The high end store fronts give the backdrop a sense of luxury. There is shade anytime of the day on one of the sides of the square. This means that we can take photos in Place Vendome basically at any time of the day. Our recommendation is to choose something fashionable, something stylish, even formal. Even a wedding dress would look gorgeous in Place Vendôme. The Notre Dame area includes the Notre Dame Cathedral, Ile de la Cité and Ile Saint Louis. This is probably one of the most authentic Paris photography locations. Because the city of Paris initiated from these two islands. The backdrops are best described by cobbled stone streets, quaint Parisian cafés, beautiful bridges, hidden squares and picnics by the Seine river. All to say, there is a lot to do in one of the most original Paris photo locations. Since the fire that hit the Notre Dame cathedral on April 15th, 2019, we would recommend this location only for the streets, river Seine views and quaint cafés. The cathedral itself will be probably covered in scaffolding for a long time. This is where you can lose the formal attire and put on something more relaxed, casual. Even something that reminds of the French riviera (think of stripes, etc) could work perfectly. The Palais Royal is a former royal palace and it has a very Parisian look. Think of elegant architecture, sumptuous columns and a beautiful garden. As one of the best places to take pictures in Paris, the Palais Royal gets crowded fast, especially around 9AM, when French people start their work day. It looks pretty every season and also in the rain. There are a few spots that are covered, so rain is not a problem at Palais Royal. The backdrops with elegant architecture require an elegant outfit. Not necessarily formal, but elegant. Props are not recommended for this location because it will attract attention from security guards. It’s best to be discrete and to take photos fast.